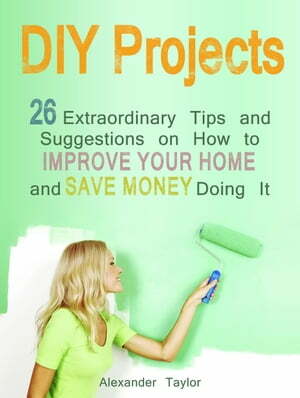 Collins Booksellers - DIY Projects: 26 Extraordinary Tips and Suggestions on How to Improve Your Home and Save Money Doing It by Alexander Taylor, 9781386860280. Buy this book online. Do you complain about monthly heating bills or water bills? Do you find yourself asking how is it possible for your cooling or electric bill to be so high when receive it? Is there a room in your home you have been hoping and dreaming of remodeling but keep putting it off because of obscene costs? If you are a homeowner than you will greatly benefit from what you can learn from 26 Extraordinary Tips and Suggestions How to Improve Your Home Saving Money and Refine Home Conditions. Most of the topics covered are effortless things you can do around your home to not only cut back on wasted energy but also cut back significantly on your monthly bills. Whether you are in need of learning ways of to save on bills every month or how to tackle that big remodeling project, you will find useful do-it-yourself tips that can reduce your monthly bills and cut wasted cost of remodeling. Some of these tips will have you wondering why you did not start them sooner.